S.A.M. Trainor was born in Birmingham in 1972 and was educated principally by his argumentative family in between those erratic periods of attendance at King Edward VI Camp Hill School for Boys that were not sacrificed to his urgent need to read more books. As an adolescent he played the violin in various local orchestras and the guitar in various local bands, and was generally considered an eccentric waste of talent. After a year spent earning a scratchy living from his music he decided that the financial viability of the artform, however meagre, was too comfortable to suit his artistic pretentions. Realising this could never be the case where abstruse formal verse was concerned, he promptly switched to writing poetry. He has done little but look back since. 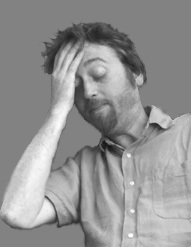 In 1991, having written only one essay (which began as a completely extracurricular exploration of the songs of Vivien Stanshall and concluded as an equally extracurricular marxist critique of popular music), he dropped out of Sheffield University and went to live in Newcastle with his partner. There he edited a fledgling poetry magazine called Pigeonhole, in collaboration with Ben Rice. In 1995 he moved to Glasgow and went back to university. He didn’t leave (either the city or the university) for another 10 years. During this time he was the first placed Arts graduate in the University of Glasgow for 1999, taught Literature and Creative Writing, wrote fiction and non-fiction of various sorts, performed poetry locally and internationally, co-produced a CD of spoken-word performances, and lived in several West End flats (one of which had rats, a sewer that flooded in the hall and electricity that ran off streetlights; another of which had burglars that lived in a fortified outhouse by the bins, where they would play his stolen musical instruments extremely badly in the wee hours of the morning). He also lost his partner of 11 years in that city (to a cricket-playing Scot... never trust a cricket-playing Scot), but has almost nothing but fond memories of the place. Since 2005, he has lived in Northern France with his wife, Julie. He writes and teaches English. He is no longer pursued by Council Tax enforcement officers. Cosmopolitanly brummie, lovingly argumentative, laconically verbose, individualistically socialist, stoically epicurean, sceptically utopian, strictly liberal and downright uplifting. A small Northern French terraced house with a bit of garden where we grow food and flowers. There’s a book-strewn office in the attic that is an icebox in the winter and a kiln in the summer. The nextdoor neighbours are Steptoe et filles. In more words than necessary: don’t ask. I haven’t read it yet, thank god. 9. vision of the future? Music should be participated in rather than consumed. It is the single most worrying feature of our culture that we have turned humanity’s definitive (psycho-social) activity into a mass-produced exchange commodity; one that has become little more than an index of illusiory wealth and power (literal and abstract) and can now be traded and consumed in almost every conceivable physical location and social context. Asking about one’s taste in music is worse even than asking about one’s taste in politics or philosophy. If I have any coherent political / artistic credo whatsoever it is that the application of ideologically infantilising notions like taste to these fundamental media of human interaction should always be resisted... I make an exception, however, for 5 Star, Gerry and the Pacemakers, Mantovani, and Tchonniallidé. Postmodern troubadour (i.e. an unaccountably well-fed and highly-sexed mendicant poet responsible for composing brilliantly witty, syntactically baroque and mathematically complex formal lyrics in a Middle-French dialect which would take the form of an array of impenetrably encoded, maginficently vain seductions of various inscrutable objects of desire with huge and stringently hierarchical families who are the poet’s temporary patrons and who would obviously never countenance a relationship between one of their offspring and an itinerant servant, however highly educated, but which are in fact allegories of an impenetrably encoded, magnificently vain attempt to convince the French government to include “Troubadour” in its list of official professions... éventuellement to give the job a public-service status equivalent to that of a fonctionnaire d’état, catégorie A... with a generous backdated pension). Fortunately, I lend no credence whatsoever to my dreams. Swollen, sticky, sweet, speckled with sesame.